Midrange indicators remain strong. Long leading indicators are very mixed, and what is going on with consumer spending? Q4 GDP: and the news from the long leading indicators is . . . I discuss the two long leading indicators found in this morning's GDP release, as well as further information from housing, over at XE.com. In case you thought Trump was imploding . . .
For those of you who may be cocooned in the liberal blogosphere, I'm afraid I must administer a cold slap in the face. 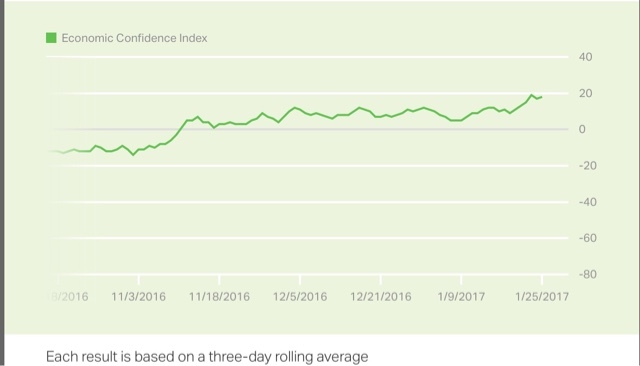 Here is the graph of Gallup's Economic Confidence Survey from its inception nearly 10 years ago. Notice that spike to new highs right at the end? Prof. Brad DeLong in an article earlier this week made a bold claim: that "US trade agreements have not substantially harmed manufacturing employment. Period." I am making the equally bold claim that he is wrong. There are at least two major points in his article that I believe are plainly incorrect. .... One possible baseline, given how many people hold up Germany as a model for the way it has protected its manufacturing, is to assume that under the best policies, the US would have matched Germany. It would have shed about 50 percent of its manufacturing job share since 1971, rather than the 62 percent that we did shed. That would have given the US today manufacturing employment equal to 12.2 percent rather than 8.6 percent of nonfarm employment. That represents a gap between reality and one theoretical alternative world of 5.4 million manufacturing jobs. Call that the excess shrinkage of US manufacturing. The only reason that both are conquerable starting in the 1970s is because Germany's %age collapsed in tne early 1990s, as part of the integration of Soviet East Germany into the unified country. Take that away and the experience in the two countries isn't even close. 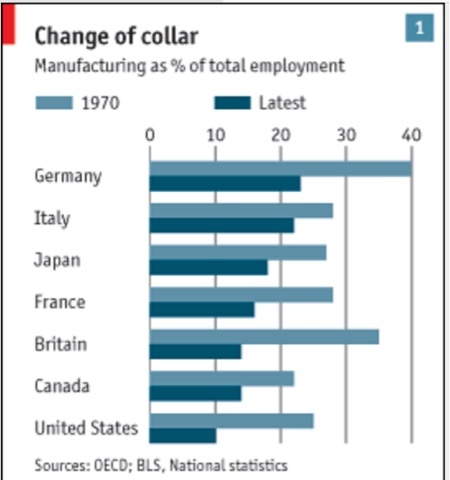 Since 1995, Germany has only lost about 10% of its manufacturing jobs. The US at its worst after the Great Recession lost over 1/3 since 1995. So it is more accurate, using your own yardstick,to call that addition 2/3 loss of manufacturing jobs "the excess shrinkage of US manufacturing." To be fair, DeLong does mention the integration of East Germany into the whole, but he never explains why this doesn't spoil his comparison. What Germany did wasn't on par with NAFTA. It was on par with admitting Mexico as a state in the US! Yeah, I think if Mexico were admitted as a US state, manufacturing employment in the newly united whole would be a lot lower. When those artificial supports for bad businesses disappeared, did East Germany's workers move on to more productive work? Yes, most of them did. Many moved to West Germany and its more robust economy. Some, however, did not. And enough wound up on the dole that the sociological aftershocks are still being felt today: Even 25 years later, unemployment in the former East Germany is 3 percentage points higher than unemployment in the former West Germany. But consider this too: An East Germany that was only 40 percent as well off as West Germany in 1989 is now 80 percent as well off as West Germany. It is very hard to say that the shedding of inefficient, unproductive, and low-wage manufacturing jobs was a minus for East Germans. In the first place, those 3% additional unemployed might disagree with you. But to return to my Mexico analogy, if 20 years after admitting Mexico as a US state, Mexico had improved from 40% to 80% as well off as the pre-existing US isn't the issue. The issue under this circumstance is, whether or not the pre-existing US was better off. In other words, take East Germany out of the equation, and focus solely on the areas of former West Germany, and maybe you've got a point. Bottom line: That 2/3's of the loss of manufacturing jobs in the US is in excess of Germany is strong evidence that Germany has NOT had the same pattern as the US. It actually undercuts Prof. DeLong's position. My apologies for the lack of posting this week. The proprietor of this here site is enjoying a cruise to an Undisclosed Location, and I have been involved full-time in a real-life project that needed a bunch of decisions right away. Fortunately, basically nothing has happened so far in the world of nerdy economic data, so its not like you missed anything important. Hopefully later today regular boring nerdiness will resume. Yeah, I know, stopped clock and all that. I suspect he is going to make good on #1, 2, and 4. It is a bad time to be a Muslim or illegal immigrant. In particular, it is a very bad time to be a "DREAMer" who signed up for DACA. Unless the Obama Administration destroyed the data on the way out the door, the easiest way for Trump to make good on deporting illegals, is to knock on every door of the 800,000 DREAMers who signed up for DACA, and deport them and every other member of their families. It is going to be absolutely heartrending for those who had no say in their being here illegally, and have only known the US as their home for the last 10, 20, or even 30 years. Similarly, repealing Obamacare may or may not be a disaster depending on whether or not the repeal is delayed, and what if anything the "replacement" is. If Trump fails to add about 10,000 manufacturing jobs a month, his working class voters are not going to be happy. That's without even considering the fact that he and Congress are likely to have to deal with a recession during his term. On #5, we know what Paul Ryan wants to do. Is Trump going to honor his promise, or betray his voters? It is safe to say that if he fails at #3 and #5, he and his GOP Congress will be swept away, and I do not think most Americans want DREAMers deported even if they dislike illegal immigration. As a progressive -- as a New Deal democrat -- I believe the next 2 to 4 years are going to be awful for American society, and for the world in general. But at the end of the day, Newt Gingrich is right. And I believe those currently in power are going to fail dismally at governance as they will be judged by the American people. 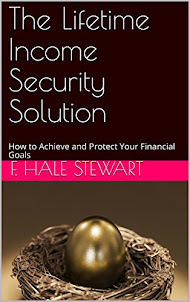 Particularly in view of the massive protests yesterday, which were probably the biggest grassroots protests in US history since the 1960s, there is much to be written about the deep and intense division in this country, both economically and politically. I anticipate writing about this in depth in the near future. But before that, let's take one last look at one important aspect of Obama's economic record. 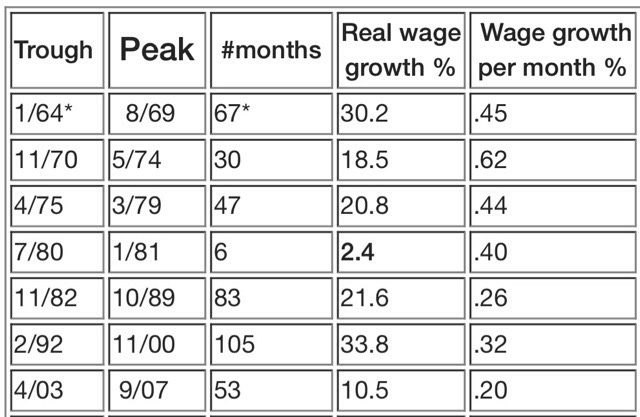 The most recent trough for aggregate real wages was in October 2009. So far, real wages grew 20.7%, or just shy of .25% per month, as of July, 81 months after the last bottom. As shown in the above chart, four of the past 7 recoveries have been better. Three were worse. The peak so far in this wage recovery is only 0.1% lower than Carter's, and 0.9% lower than Reagan's. Obama's wage recovery is the second longest on record, surpassed only by Clinton's, but it is also the second weakest in terms of monthly wage growth, beating only George W. Bush's. 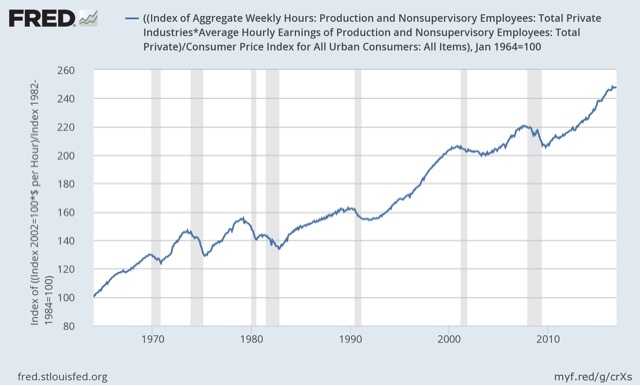 The peak in Reagan's wage recovery, at +21.6%, actually happened during George H.W. Bush's presidency. 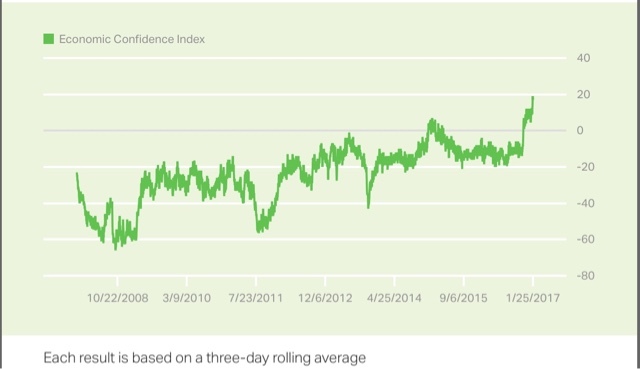 The peak so far in Obama's recovery is 20.7%, but there may be further improvement this year. In short, Obama finished his term with about average real aggregate wage growth -- not spectacular, but not awful either.